Savas Beaties “The Maps of” series makes available high quality detailed maps to the general public. Each book contains a series of maps with a narrative battle on the facing page. The multi colored maps maintain, as much as possible, the same scale in each set. The result is a battle history that is an enjoyable informative read and battlefield guide. Antietam maintains the high standards of this series and may raise the bar a little. This is a full campaign with maps for each major component. Map Set 1, covers the invasion starting on the second and ending on the 13th. Nine maps, using the same scale, allow us to easily track the position and progress of the armies. Map Set 2 – 7 is South Mountain. On most of these maps, the scale is 300 feet to the inch. A few are 600 feet to the inch and a couple uses a 10-mile scale. The action at Fox, Turner and Crampton Gap is presented in detail. Four maps cover the fighting on Frosttown Plateau. The maps coupled with the facing page’s narrative this is an excellent history of this largely overlooked area. The capture of Harpers Ferry is the subject of ten maps. The scale varies from 1,050 yards to 360 feet depending on the subject. 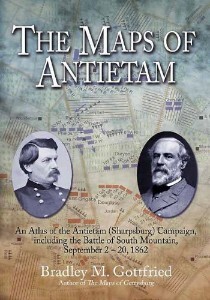 135-pages are devoted to the Battle of Antietam. Presented in a logical sequence, maps cover the approach, the action and the stalemate at dark. Given the area, the battle maps have a scale of 390 or 450 feet to the inch. The book ends with seven maps covering the Battle of Shepherdstown. In addition to the maps, the book contains an interview with the author, a complete Order of Battle, Endnotes, Bibliography and Index. This is the book Ezra Carman wanted his readers to have.